This is a very challenging portion of the TCT, but one of the most rewarding. From the Two Harbors campsite, you make your way south, across the Isthmus to the Silver Peak Trail portion of the TCT. From high atop this vantage point you will experience breathtaking, panoramic views of the Island. The 1,728-foot descent into Parson's Landing down Fence Line Road is a steep one, but with several places to rest along the way. 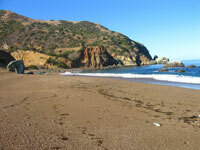 The Parson's Landing Campground is a secluded beach camping site. The eight primitive campsites accommodate up to six people each. Shade structures and running water are not provided; you must pack in your supplies, or arrange to have your equipment delivered. There are BBQ and fire rings, picnic tables and chemical toilets. Firewood and water are available for purchase both on the Reserve America site and at Two Harbors.